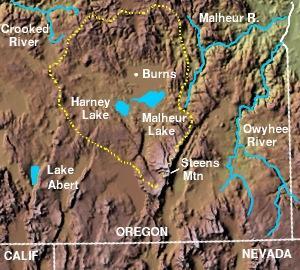 (c) In August 1994 the BLM & FWS illegally began building a fence around the Hammonds water source. Owning the water rights and knowing that their cattle relied on that water source daily the Hammonds tried to stop the building of the fence. The BLM & FWS called the Harney County Sheriff department and had Dwight Hammond (Father) arrested and charged with “disturbing and interfering with” federal officials or federal contractors (two counts, each a felony). He spent one night in the Deschutes County Jail in Bend, and a second night behind bars in Portland before he was hauled before a federal magistrate and released without bail. A hearing on the charges was postponed and the federal judge never set another date. ...Both Dwight and Steven were booked and on multiple Oregon State charges. The Harney County District Attorney reviewed the accusation, evidence and charges, and determined that the accusations against Dwight & Steven Hammond did not warrant prosecution and dropped all the charges. (q) June 22, 2012, Dwight and Steven were found guilty of starting both the 2001 and the 2006 fires by the jury. However, the federal courts convicted them both as “Terrorist” under the 1996 Antiterrorism Act. Judge Hogan sentenced Dwight (Father) to 3 months in prison and Steven (son) to 12 months in federal prison. They were also stipulated to pay $400,000 to the BLM. Hogan overruling the minimum terrorist sentence, commenting that if the full five years were required it would be a violation of the 8th amendment (cruel and unusual punishment). The day of the sentencing Judge Hogan retired as a federal judge. In his honor the staff served chocolate cake in the courtroom. (s) Sometime in June 2014, Rhonda Karges, Field Manager for the BLM, and her husband Chad Karges, Refuge Manager for the Malheur Wildlife Refuge (which surrounds the Hammond ranch), along with attorney Frank Papagni exemplifying further vindictive behavior by filing an appeal with the 9th District Federal Court seeking Dwight’s and Steven’s return to federal prison for the entire 5 years.